When 32-year-old Surjit Desai (name changed) walked in to the Seven Hill hospital's outdoor patient department with complaints of chest pain, doctors would have never thought that an embedded screw in his lungs could be the reason. To add to the doctors' confusion, the patient is unaware of how did the screw reached the lungs at the first place. "Desai had a mild but significant pain in chest region for last 2-3 days. While initially, he tried ignoring it but persistent pain led him to take medical help," said Dr Amit Panjwani, pulmonary medicine expert, who treated him. He further said that Desai's mother had asked him to take a chest X-ray before approaching the hospital. "The X-ray report revealed the presence of screw. We were surprised as Desai was confident that he hasn't swallowed any screw. Since he was having discomfort in chest region and was anxious, we repeated the test which again confirmed the presence of screw in the lower part of the right lung," said Dr Panjwani. Desai, who works as a call centre executive, was immediately questioned whether he could recall aspirating or swallowing a screw at any time in the past few days, weeks or months. The answer to this question was a negative. He was a person with no predisposing situations to unaccountable foreign body aspirations like neurological disorders, alcohol intoxication, poor dentition and sedative use. "A foreign body entering wind pipe would lead to aspiration and rigorous coughing. He said he didn't have any such thing. He only remembered gulping food few days before the incident at his work place. We immediately took him to the operation theater to remove the screw," said Dr Panjwani. According to the doctor, unlike removing a foreign body stuck in food pipe, this was challenging. "It was challenging to remove the screw form the lungs as there was always a risk of bleeding or lung puncture. Also, vital organs like major blood vessels, heart were close by. The cause of worry was if the screw migrated lower down during the manipulation to remove it from the lungs, it could damage these organs," said Dr Panjwani. Desai was subjected to the insertion of a flexible fibreoptic video bronchoscope into his lungs in a bronchoscopy suite in our hospital. The procedure was done under local anesthesia and conscious sedation. The screw was embedded in the right lower lobe bronchus. The screw was gently freed from the bronchus and skillfully grasped with a three pronged grasping forceps. With the screw secured in the grasping forceps the bronchoscope was gently pulled back from the patient's lungs and outside. 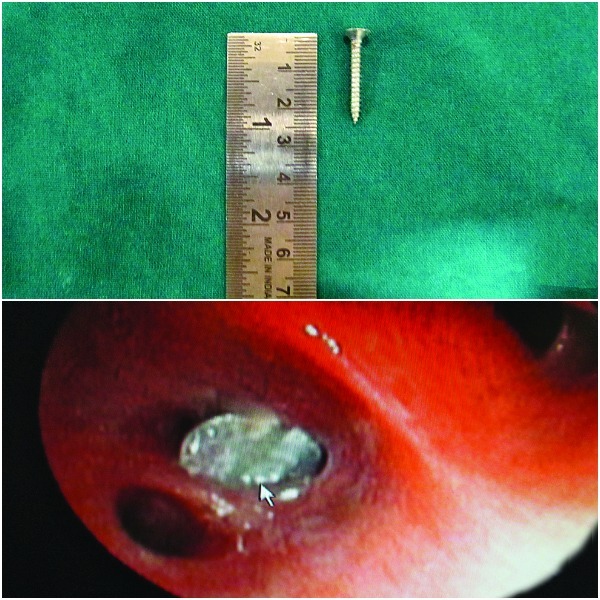 "The screw was 2.5 cm (1 inch) in size and it was unbelievable as to how such a big screw could find its way into the patient's lungs without him realizing about the same. I read through all medical literature available online. I have not seen any such case," said Dr Panjwani. While Desai was discharged after a day's observation last week, both his family and doctors are wondering how the screw found its way to the lung.